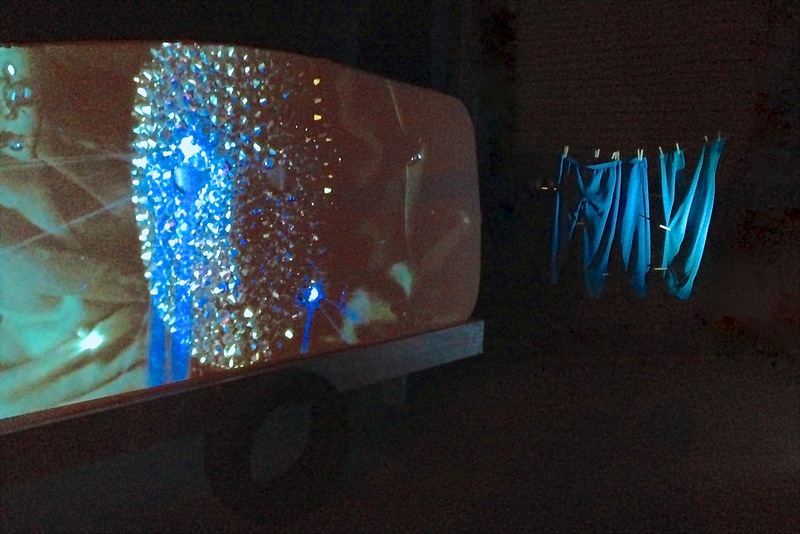 A collaborative single-channel video installation collated and created by Anna Helme for the MIX NYC 2014 Queer Experimental Film Festival in New York, November 2014. The work is a beacon for the alluring and problematic idea of queer belonging. It is a re-creation of the matching trailer-caravan homes of Jackson Stacy and Vincent Silk (subjects of Anna’s short film MyMy), which are parked in the backyard of a rambling queer mansion and ex-nunnery called the Dirty Habit, in Sydney, Australia, where for a while we all lived. It contains video pieces by collaborators and queer family members Justin Shoulder, Bhenji Ra, Nina Buchanan and Jackson Stacy as a multi-faceted view of the threads of influence that make up the fabric of a small queer community. Also included is an poem by Vincent Silk which I asked him to write on the topic of the ups/downs of queer family (in the film Vincent plays Jackson’s cyborg twin, the biggest little joke about chosen family / belonging, and Justin plays a monster he made mashed up from them both) and how together we make variously beautiful and painful messes of the project of community. Instead he wrote something about his fetish for family, but as one of his dads I say that’s fine too. More about the MIX NYC festival here on Huffington Post. Stephane Gerard's premiere of History Doesn't Have to Repeat Itself at MIX NYC. Incredible intricate flowers handmade by volunteers for space design by Diego and Bizzy. Another long night of experimental queer film. Dancer, Saturday night at MIX. MY. Tracksuits worn by Vincent and Jackson in MyMy. Nina Buchanan's Sigils Ov Preservation. MyMy Radix by Anna Helme. You gotta have a strong heart to live in New York. You gotta have long johns to live in New York. A long night at MIX.